Watch the video above to get a taste of how great this library sounds! We went all in with the huge CINEMATIC ensemble strings, and sharp punchy Pizzicato and Staccato strings too. We layered up huge string parts together to form colossal string stacks (Multi Layered Kontakt Instruments) - ideal for movie strings, scoring or epic hip hop bangers. 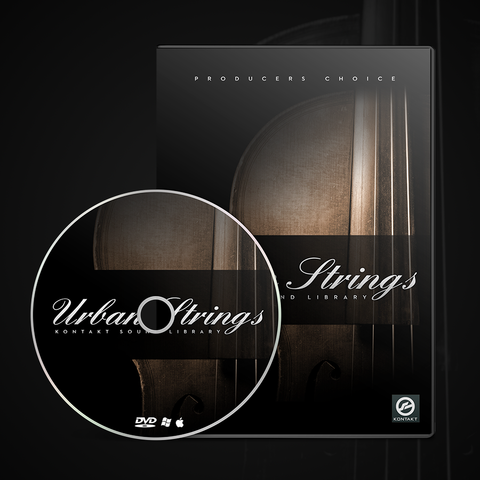 When you own a copy of Urban Strings, you own it for life. We will be adding new patches and instruments to the library, and previous customers will get all future updates - free of charge. We made the interface super simple so you can focus on making music. Urban Strings sounds epic straight out of the box. You will not need to touch a single knob - just load a patch in one click and start making great music. No iLok or registration required. Just download, load and play straight away. Our custom interface includes ADSR controls and a Vintage mode for adding extra bite to your strings. Urban Strings is lightweight and fast loading. It will NOT hog your CPU/RAM - and you can easily load multiple instances with no problems. This library comes in Kontakt format (Other formats coming soon). You'll need Kontakt 5 to use the library. We also include WAV multi-samples incase you wanted to load into another sampler such as ESX24.